It’s not often that I bring films into the archive, Daniel tends to have a knack for finding the best on the web in the fields of art, design and craft. But today I came across this short piece that doesn’t have any commentary, but has very simple filming and features some curious ongoings. In fact, I’ve been studying the processes behind lacquerware and the methods they use over the last few months which led me onto this short film that showcases lacquer artist Kenji Suzuki scratching the urushi tree. Although the cutting may seem harsh to those who’ are newcomers, the process that Kenji is going through is named ‘kakitori’. He skilfully makes small incisions locally on the bark, in such a way that the liquid can be captured. They collect this liquid for its unusual and special properties, it gives bowls and other wooden objects a substantial amount of protection and they’ve also found that bacteria in the urushi is zero to none. A few things I didn’t know personally about the urushi tree is the fact that it originates from the Himalayas and is also a family member of the mango, cashew, and pistachio tree. The liquid itself is a substance produced by the tree to prevent the rotting process when cut near the stem, a liquid with sterilising properties which dries fast and turns solid in humid air. Kenji, who can be seen in this film below, works in Johoji, Iwate Prefecture as a lacquer artist, a skill which has been passed down to him. 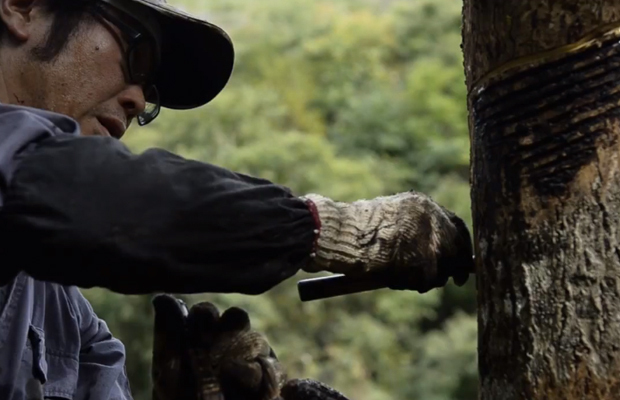 He collects lacquer from over 400 trees per year, which is quite mind boggling when you come to think about it. Keep in mind that this process of kakitori is repeated every 4 to 5 days, from the middle of June until the end of October, with 700 to 1000 incisions being made on each urushi tree. As a European I’m obviously quite fascinated by this craft, since it’s not something you come across here often, but I’d urge you to research it and maybe find out more. I’d love to have a go at making lacquerware myself but the general concept seems quite far derived from what most people are doing here. One place that has caught my attention though is a website called Urushi Kobo that’s run by Mariko Nishide, it’s based in The Netherlands and they hold various workshops and lesson groups. I’m hoping to find something like this near me!